Finding the right track and field board for your team can be an overwhelming task. It may be easy to Google Track Record Boards, but how do you narrow it down from the endless search results? Here are a few key considerations to be taken into account when searching for the perfect board to represent your team. Location – Where will the board be displayed? 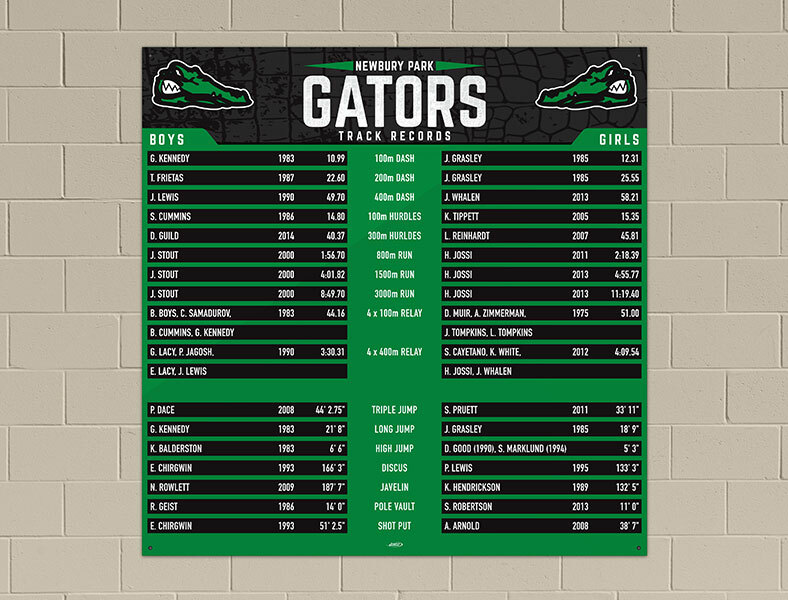 This is probably the most important factor when choosing a track record board. Is the board going to be located indoors or outdoors? High on a wall, in a hallway, across a gym or pool? There are several different ways to construct a record board, but the location determines many of the specifications. If the board is going to be located outdoors you are going to want to be sure it is made of durable materials. We always recommend an aluminum base and high-quality laminate. The aluminum will be sure to last a long time and a high-quality laminate ensures that the colors will avoid fading. For indoor applications we recommend a PVC or acrylic base paired with a sturdy laminate. We offer laminates in gloss or matte finish. The matte finish is the most popular as it reduces glare significantly. Now that you know what material to use, consider the viewing distance. How far away will people be away from the board? If the board is in a hallway, the font only needs to be .5”-1” tall. This allows a viewing distance of 16’-32’. If the board is going high up on a wall or across the pool or court, consider something larger. We recommend a minimum of a 2” font, this allows the records to be readable from about 66’ away. Updating – How often will you update the board? Updating you board ultimately comes down to the style and materials chosen. Different companies can do this in different ways, but the key is simplicity. If the records are difficult to replace, how often will you want to update them? All of our boards are easy to update, and we recommend updating your record board once a year at the end of each season. We have heard nightmare stories of having to remove individual lettering or even having to take the board down and ship it back to the company. Always know how your board is updated, don’t just assume it is simple. Always consider how easy or hard it will be to get your update, remove the old record, and then add the new record. Installation – How will the board be attached to the wall? Is it a complicated bracket system or screws and anchors? Most record boards have a simple installation, but the larger the board gets, the more difficult an installation can be. Think through the whole project and be sure to inspect the wall for any potential issues. If the board can be installed by you or your staff, the cost of the project will be greatly reduced. Looking to get your record board project started? Reach out to one of our sales reps today to get the conversation started. We would be happy to get a free proof and quote together for your project.